A large number of churches and cathedrals around the country protect their treasured stained glass and leaded light windows using Glasswood`s custom-made hand-crafted church window guards. The best guards are the ones that are barely visible from a few feet away whilst blending in with the character of the church building. We go above and beyond to ensure that the guards we design and create fit well into the surroundings. Glasswood is the leading expert in the South West in the design and manufacture of church window guards, with more than 40 years’ experience of helping churches protect their precious stained glass. 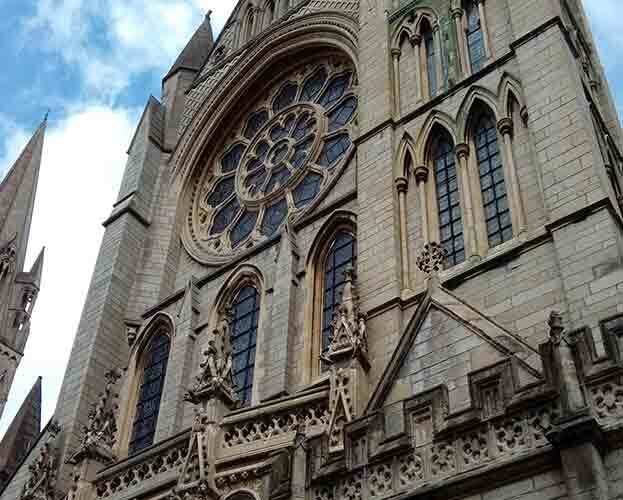 Glasswood`s church window guards are specified and recommended by many architects and been installed at Truro cathedral in 2017. We have expertise in measuring, producing and fitting complex-shaped church window guards that has been built up over several years. We offer a full service including initial site survey, making and installing the window guards. The first step in making church window guards is to take accurate templates to ensure the guard fits neatly within the reveal, and follows the contours of stone and glass. An accurately fitting church window guard will be be more aesthetically pleasing and less noticeable. time is taken to ensure that the templates are as close the the stone as possible to reduce the visibility. 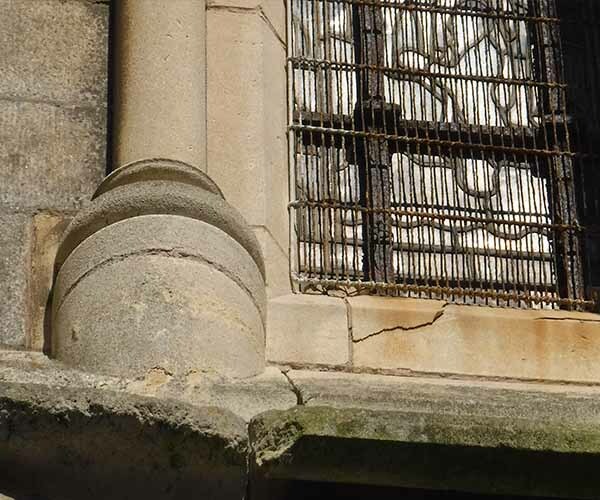 Ideally, as recommended by English Heritage and Nation Trust, each window light and tracery should have its own guard. In practice, Glasswood selects the best design for each church and window, taking into account architectural, structural, aesthetic and financial factors plus location! Church near to coastal area`s would require a higher grade of stainless steel. When Glasswood team fit the church window guards, we use our own method of invisible fixings that cannot be seen except on close examination. We use only the highness grade of stainless steel fixings to ensure that beautiful stonework will not become marred and discolour. the guard are also polyester coating that improve the longevity of the mesh. Glasswood has unparalleled expertise developed over 40 years in designing and making church window guards. We employ highly skilled and experienced craftsmen – welders and wire workers – and we have particular expertise in designing guards to suit complex windows and situations, for example large windows with many traceries for Churches and cathedrals. We are particularly well known for our traditional mesh window guards. To our knowledge we are the only company in the country making window guards using these traditional methods. 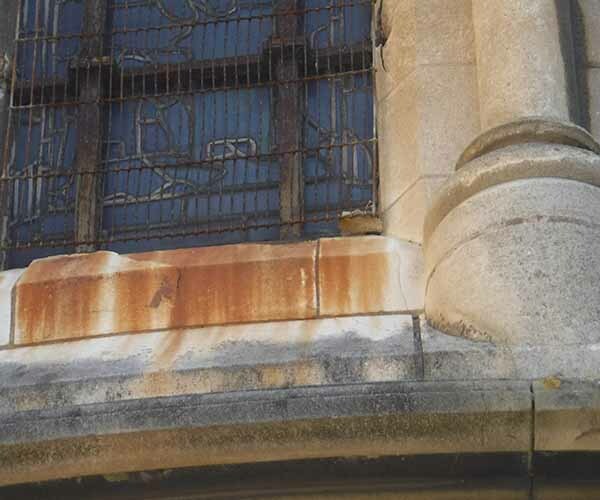 Churches and historic buildings have widely varying window designs and shapes and our window guards are custom made for each individual window. We produce separate guards for each window light and tracery. The guards will be made from 3” x ½” (76mm x 12mm) weld mesh made from 12swg (2.64mm) stainless steel wire on 5swg (5mm) stainless steel round bar frame. We use high quality 304 or 316 grade stainless steel wire manufactured specially to our specification in France. Glasswood uses high quality 304 and 216 grade round bar sourced from English companies. The guards will be coated in polyester black. (Polyester powder coating is recommended for general exterior situations, where good weathering resistance is required).